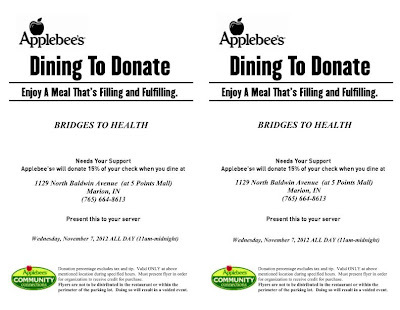 Wednesday, November 7th if you eat at Applebee's in Marion (11am - midnight) and present the Dine to Donate flyer (below) when you pay your server, Bridges to Health will get 15% of your bill as a donation to the clinic. Bridges to Health is Grant County's only free health and dental clinic, providing primary care, dental care, health education and medications for uninsured Grant County residents who make 200% or less than the poverty income guidelines. A 501c3 non-profit, the clinic relies on donations and grants to keep it's doors open and to keep Grant County residents healthy. For more info, visit www.bridges2health.org. Need a flyer for Applebee's? 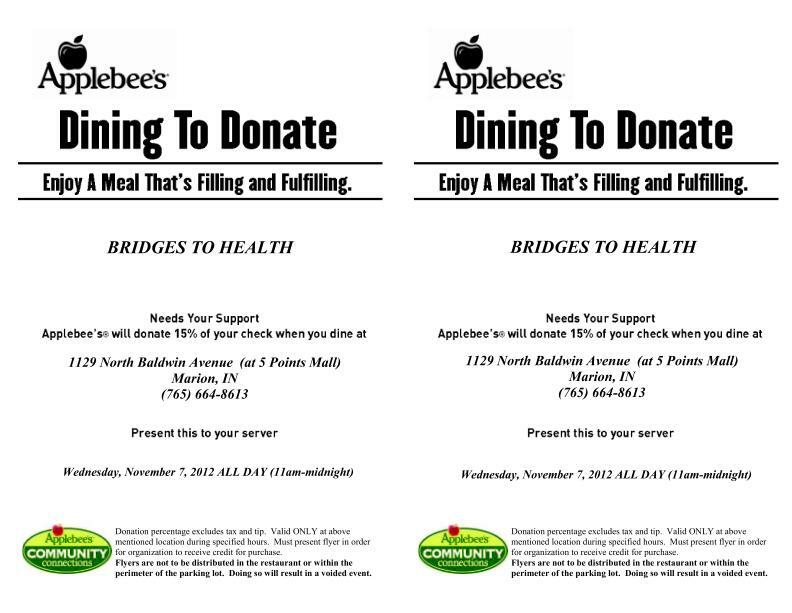 You can print one at www.bridges2health.org, email info@bridges2health.org, or stop by on your way to Applebee's and pick one up at the clinic (1251 W. Kem Road). Thank you for helping keep uninsured Grant County residents healthy!